David Urquhart will be remembered in many ways and by many people: born salesman, legendary figure in Scotch whisky, talented yachtsman, proud espouser of all manner of local causes and organisations. This is an adapted version of the official obituary issued by Gordon & MacPhail, followed by some of the many tributes paid to David. Reporting by Richard Woodard, Dave Broom and Alex Taylor. A proud son of Moray, David Urquhart involved himself in just about every facet of local life: sailing, pipe bands, business development, the Royal Highland Show and, of course, Scotch whisky. When he died at the age of 63 on Monday, 30 November after a long battle with cancer, David was a non-executive director of Gordon & MacPhail, and a representative of the third of the five generations of the Urquhart family to own the company. From 2007 until his retirement in 2012, he was its joint managing director. David Alistair Urquhart was born on 5 October 1952, the third child of George and Peggy Urquhart. In his schooling, at Aberlour House followed by Gordonstoun, he showed a flair for all manner of sports: a first XV rugby player, and an excellent sprinter, hockey player and cross-country runner. David officially joined Gordon & MacPhail in 1972 after leaving college, but had already accumulated many hours with the business, helping out in the shop on South Street, Elgin – a fascinating place for a small boy to spend time in, as he fondly recalled later in life. His first professional task at Gordon & MacPhail, handed to him by his father, was to hit the road and cover the north of Scotland, accumulating countless miles in the development of the company’s business. David continued this role south of the border, becoming UK sales director, before taking on the role of joint managing director in 2007. In 1977, David was invited to the Findhorn home of one of the company’s fruit suppliers for a Hogmanay dram. While there, he met the businessman’s daughter, Sheila, and they married the following year. David and Sheila set up home first at Kellas, outside Elgin, before moving into the house at Findhorn where they had first met, raising twin sons, Richard and Stuart, who later joined the family firm, much to David’s delight. Another high point came in 1993, when the company bought Benromach in Forres, realising a long-held family dream to own a distillery. Beyond whisky, David’s great passion was sailing, one that he shared with his father and with both of his sons. His enthusiasm and talent took him to competitions throughout the UK and abroad, winning multiple Scottish Championships and competing in the Albacore class of the World Championships in Canada in 1977. In the mid-1980s, David moved from dinghy racing to yacht racing and was a class winner at the 1999 Scottish Series, as well as competing in large events such as Cork Week. David was also heavily involved in the Royal Findhorn Yacht Club, serving as Commodore for three years from 1989, and taking the first amateur club team to compete in Russia in 1990. His twin passions for whisky and sailing coincided when Benromach became sponsor of the Clipper Round the World Yacht Race in 2009, allowing David to revel in the chance to spend time with legendary yachtsman Sir Robin Knox-Johnston, who became Benromach’s global brand ambassador. David Urquhart’s long career in the whisky industry brought him many accolades, including lifetime achievement awards from Dram magazine and the Oran Mor Whisky Awards. He became the 16th inductee into the Whisky Magazine Hall of Fame in 2013, was made a Master of the Quaich in 2008, and was ‘immensely proud’ when sons Richard and Stuart became Keepers of the Quaich earlier this year. 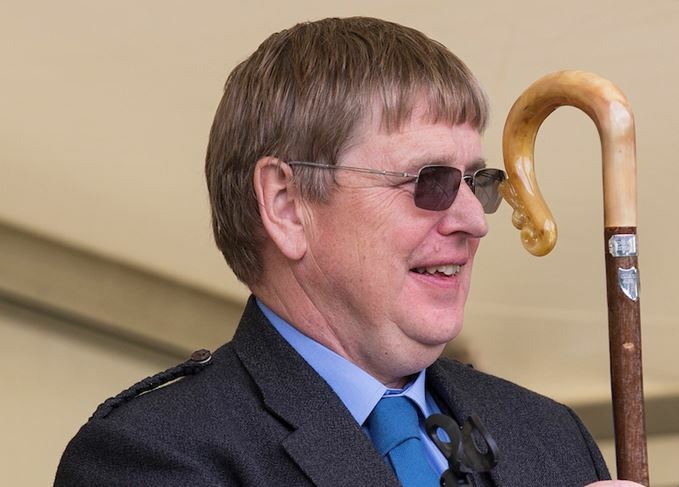 Other contributions are almost too numerous to mention: president of the Scottish Licensed Trade Benevolent Society (The Ben) in 2004-5; involvement in the food and drink committee of the Royal Highland Agricultural Society of Scotland, from which the Urquhart family received a lifetime achievement award in 2003; a stalwart of the Royal Highland Show, introducing show-goers to the delights of single malt whisky at the Gordon & MacPhail stand. Events were also David’s passion. He was instrumental in attracting the European Pipe Band Championships to Forres for the first time, a move so successful that the competition is set to remain there for a further three years. ‘It could not have happened without his positive attitude, his boundless energy and his good-natured yet persistent cajoling of sponsors,’ notes the obituary from Gordon & MacPhail. It continues: ‘Despite ill health in retirement, David never slowed down. It simply wasn’t in his nature, having been such a hard worker all his life, and it was only fairly recently that he stood down from his various commitments. ‘David Urquhart was a gentleman in the true sense. He was also a whisky man but, more importantly, he was a family man. I will always recall him standing in the Elgin warehouse, surrounded by venerable casks, smiling quietly to himself, saying: “I suppose we do have quite a lot,” and then going on to talk, at length, passionately, about the importance of time, of laying stock down for future generations. ‘On the surface, it was an example of his understanding of whisky’s long-term nature, of the mechanics of the business, but underpinning this and all of our many conversations was his belief in the importance of people, and of family. ‘David ensured that this formed the cornerstone of the business which he helped to transform. G&M didn’t just mean bottles; like David, it stood for values. ‘Any conversation we had would start around whisky, but would then leap off into other areas: the European Pipe Band Championships, or the saving and regeneration of Elgin’s small businesses. Soon after I had expressed an interest in sailing (David was a world-class yachtsman), I found myself, somewhat starstruck, at a table with Robin Knox-Johnston and other solo round-the-world sailors. Just one example of his quiet generosity, his love of connecting people. ‘David’s death was not unexpected – he had been in poor health for some time – but it still came as a shock and a sadness. I remember him as a quiet and modest man who never vaunted his huge knowledge of Scotch whisky and of the whisky trade, in which he played such an important role for so many years. ‘A driving force in the rapid development of Elgin’s most famous independent bottler into a company renowned as much for the top quality of its single malt offerings as for the ownership of Benromach distillery. ‘In his last years he tirelessly endeavoured not only to dedicate his time to his wonderful family and friends, but also selflessly in the interest of others – a characteristic which he showed throughout his life. His positive attitude and determination defied the doctors in the last months of his life and he is a wonderful example to us all. ‘He was a gentleman who upheld all the best virtues and characteristics of a company and industry with which his family has been closely involved over generations. ‘I remember speaking to David several times at various BBC Good Food Shows in the early 1990s, years before the launch of Whisky Magazine. However, it was at the annual Bowmore Horse Trials that I got to know him a little better. ‘I was struck at the time by his extraordinary depth of knowledge and, especially, that he knew precisely what was going on in the industry at any given time. I enjoyed our conversations very much as it was a great opportunity to learn from one who was dry, quietly spoken and sharp as a tack. ‘I met David several years ago and I was amazed at how this high-profile businessman was such a down-to-earth person with a massive sense of humour. He was very professional in his family business and also a great ambassador for the whisky industry. ‘I was hugely honoured to be invited to his retirement dinner at Innes House a few years ago. The calibre of guests and the kind words spoken about David proved how much he was respected by family, friends, colleagues and business contacts. He will be truly missed within the whisky industry. ‘David Urquhart was much-loved, he made an enormous contribution to business and community life in Moray. He leaves behind a rich, lasting legacy, having played a crucial role in so many projects. Three full-bodied 1940s and ‘50s whiskies bottled for the US take Angus MacRaild’s fancy. The Speyside, Islay, Sherry cask and peated cask Scotch whiskies join The Classic Range. Speyside malt is sold by Berry Bros & Rudd seven years after moving in opposite direction.